Taichi Rushing and Sudden Agile Fist is an ancient shadowboxing popular in Wen county, Henan province. It features aureole all around the exerciser, so people call it supernatural shadowboxing. 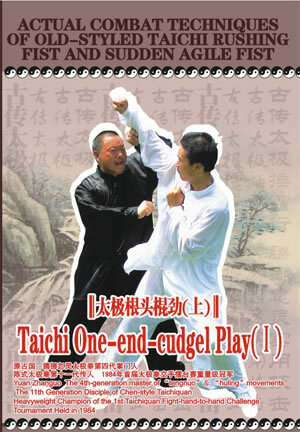 The ancients called the second routine as Taichi one-end-cudgel play which is supplemented by the first routine. Why is it called one-end-cudgel play? It's to grip one end and hit with the other end of the cudgel. This play can also disentangle oneself by a flash fighting. It also demonstrates the techniques of kicking, hitting, wrestling and capturing. Constant exercise of the first and second routines will help one experiences the integration of universe and man, as is typical of Taichiquan.